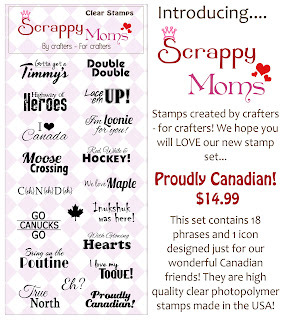 Sneak Peak 3 & 4 for Scrappy Mom's!! 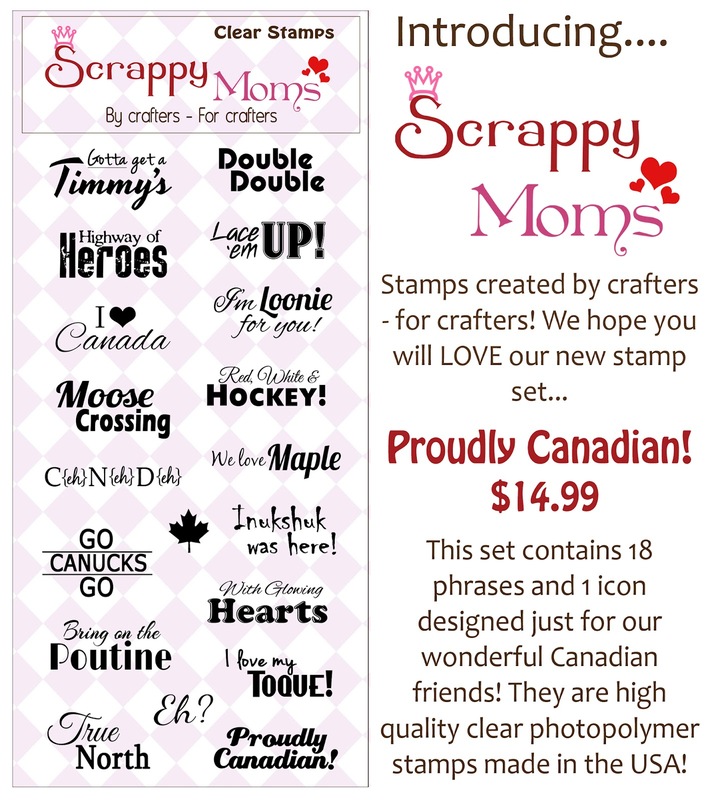 Sorry for the delayed post with my projects showing off the great stan set Proudly Canadian by Scrappy Mom's! 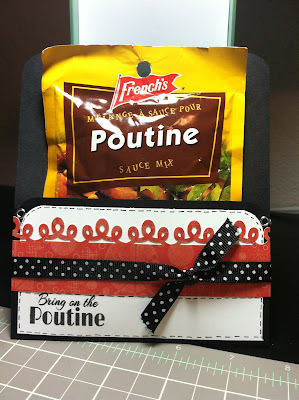 I have 2 projects for you today showing this stamp set. First let me say that if you have never tried Poutine, you must try it at least once!!! I was unsure about it the first time I tried it but I have grown to LOVE it!!! The last time my Mother in law was down visiting from Canada she brought us a TON of sauce mix packets! So I thought i'd make a little holder to give some to my brother-in-laws who also love this stuff. For my second project, I thought about using the stamp in a different way. I chose to use "Double Double" which is usually how someone would order their coffee. Well, since it was my last week at work, I had to bake for the office (and it gave me an excuse to try a new recipe). So I made a cupcake recipe that I found on pinterest called "Death by Oreo". 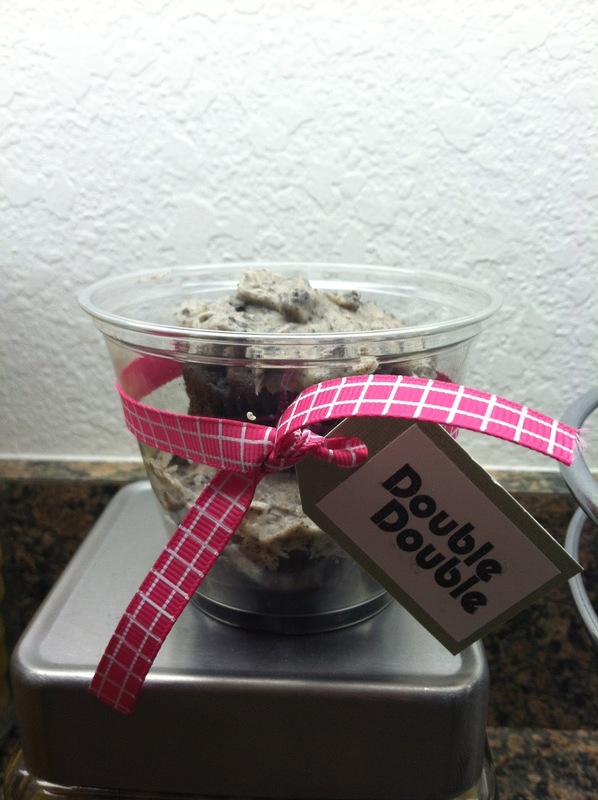 Its has tons of delicious oreo in it! You MUST try the recipe. So I decided to add a tag around the cupcake holders. Hope you guys enjoyed the sneak peaks!!! Hello everyone... Hope your having a great week. 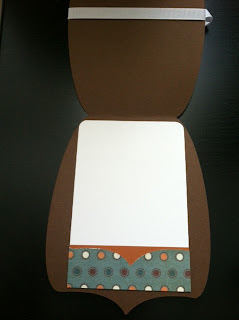 I'm here with sneak peak number 2 for Scrappy Mom's release. 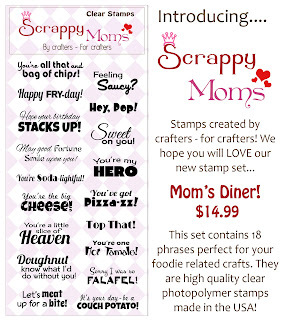 I just can't get enough of Mom's Diner stamp set. It can be used so many ways. 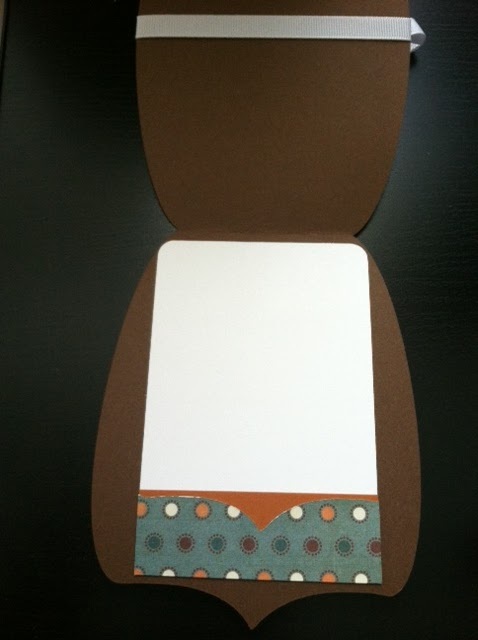 For my card, I decided to use my Silhouette. I was unsure about how I felt about the image at first but it's growing on me :). 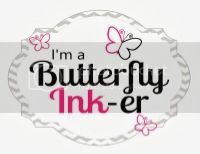 Don't forget to check out the other Scrappy Mom Sisters projects by clicking on their name in the right sidebar. Hope you all are enjoying your weekend....I'm not ready for tomorrow to be Monday. The weekends just simply fly by!!! 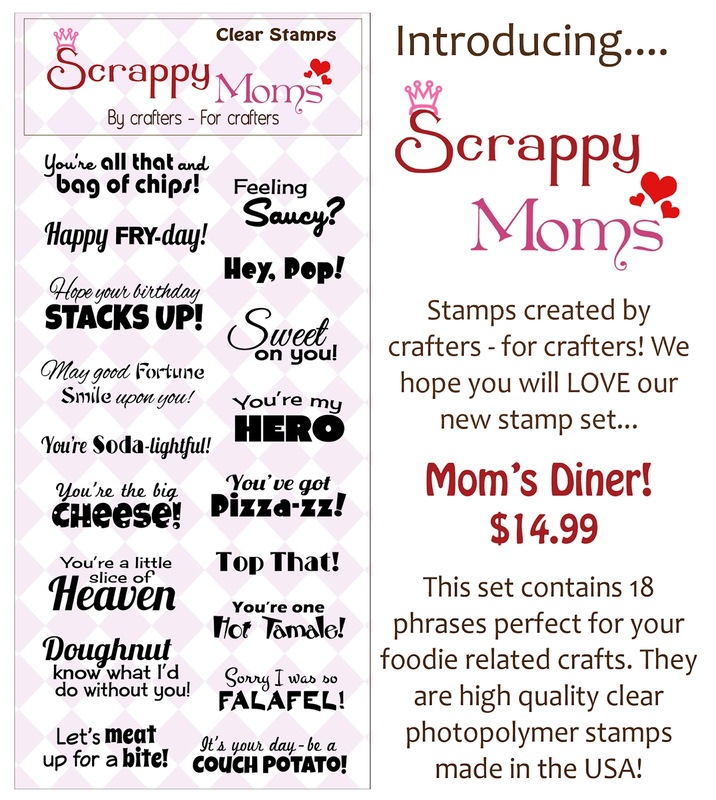 So here is my first Sneak Peak for the Mom's Diner stamp set. Hope that you guys enjoy it.....dont forget to be sure to check out the other Scrappy Mom's projects!! 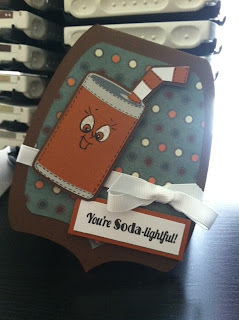 I used the Simply Charmed cartridge for the soda can and Peachy Keen Stamps Retro Paper Doll Faces. Thank goodness it is Friday!! I don't know about y'all but I am so ready for the weekend! I feel like I have so much to do in so little time. Baby Kirie will be here in 3 weeks and there is just so much to get in order. Speaking of baby Kirie, I was on a roll of completing my first project for the new stamp release and she decided that we stretch out to make me so uncomfortable that I wasn't able to finish my project :/ Unfortunately, her being breeched and just about 6 lbs. is not helping the pressure on my rips as her head and feet like to push on them quite often. So I apologize for not having a completed project ready for you today. I promise to have one for you tomorrow and more sneak peaks throughout the week. How bout a look at the 2 new stamp sets! I think they are absolutely fabulous!! The 'Proudly Canadian' is perfect for me, as my husband and his family are from Canada. And Mom's Diner is so versatile!